The Indian Navy’s expert divers after continuing day-long search operation in Dikhow River of Sivasagar district on Tuesday failed to trace the car and the bodies of the family members of victim Haren Bora. Till the fourth day on Tuesday after the incident of mishap, the NDRF, SDRF and the Indian Navy have failed to achieve any success. 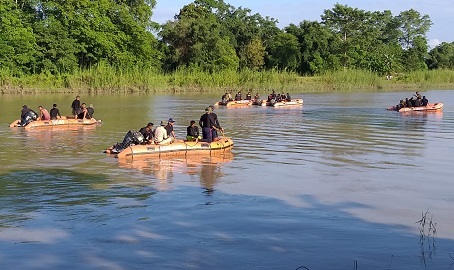 An 10-member well-equipped Indian Navy’s expert divers’ team started search operation in the river on Tuesday from 6 am. “The Indian Navy expert divers’ team tried for the whole day to locate the ill-fated car and the bodies of the victims with the help of Side Scan Sonar,” Sivasagar Deputy Commissioner Pallab Gopal Jha told media persons after the end of the day’s operation. They continued the search operation with Side Scan Sonar and confirmed that there is no trace of the car up to 3.5 km from the spot of the incident in river Dikhow, DC Jha added. 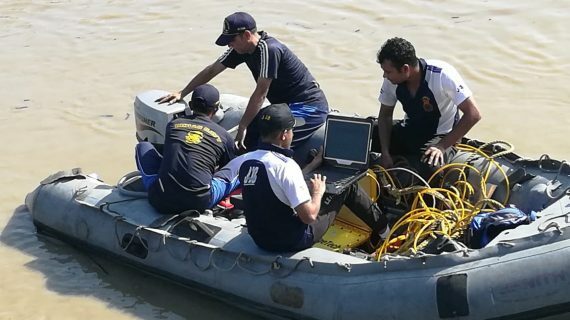 An Indian Navy official talking to media persons said that they would resume the search operation in the river on Wednesday morning at 5:30 from 3.5 km where they stopped the operation for the day on Tuesday. Earlier on the day, Bhaskar Jyoti Mahanta, ADGP, Fire & Emergency Services, told the media persons that as the Indian Navy team has started operation with advanced and modern equipment, they are hopeful of success in the operation. The Indian Navy official further informed that they are hopeful about the search operation as they have not faced any trouble during the operation. The current of the river has also slowed down with the water level receding and no mud has been found in the riverbed, he added. Though the drivers’ team found some metal in the river during their operation, later it was confirmed as something else. It may be mentioned that on Tuesday’s operation, 14 boats, 137 personnel and 47 divers carried out the operation. The five-member family of Haren Bora went missing after the Maruti Swift Dzire car, in which they were travelling, plunged into the Dikhow River at Dachial village of Dikhowmukh area in eastern Assam’s Sivasagar district on Saturday evening.